We met the bear responsible for millions of laughs since 1920 – the original Winnie The Pooh. 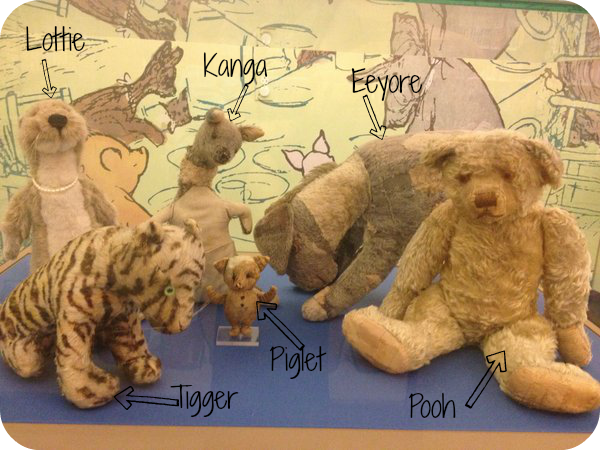 Pooh, Piglet, Tigger, Kanga, Eeyore, and Lottie the Otter are gathered together at the New York Public Library. They are visited daily in the children’s department by children and adults eager to meet the crew who inspired so many children. I told my son that just the way he has a stuffed dog, “Cliffy” and a stuffed rabbit, “Thomas,” Christopher Robin had his own stuffed animals that he dragged by the foot to the breakfast table, carried with him as he trudged through the mud outside, and snuggled with under the covers. When we were driving through our town on our trip back, we looked at our playground, the local swamp, and parks we frequent. I told my son that the “real” Hundred Acre Wood was based on a forest the Milne family played in when A. A. Milne wrote his famous books. So we could create our own stories based on places that my son knows well. We then, of course, told several stories featuring his favorite stuffed animals, and his baby brother’s favorites as well. So far this has become a regular part of our nightly story telling. We line up a few animals, and say, “Who is going to be in our story tonight?” It’s been a really fun way to create stories together.